Wu J, Trowbridge P, Yee D, McKee L, Gilbreath A. RMP Small Tributaries Loading Strategy: Trends Strategy 2018. Richmond, CA: San Francisco Estuary Institute ; 2018 . Report No. : 886. Denslow N, Kroll K, Mehinto A, Maruya K. Estrogen Receptor In Vitro Assay Linkage Studies. Richmond, CA: San Francisco Estuary Institute ; 2018 . Report No. : 888. Grieb T, Roy S, Rath J, Stewart R, Sun J, Davis JA. North Bay Selenium Monitoring Design. Richmond, CA: San Francisco Estuary Institute ; 2018 . Report No. : 921. Shimabuku I, Trowbridge P, Sun J. Bay 2017 Bay RMP Field Sampling Report. Richmond, CA: San Francisco Estuary Institute ; 2018 . Report No. : 849. Jabusch T, Trowbridge P, Wong A, Heberger M. Assessment of Nutrient Status and Trends in the Delta in 2001–2016: Effects of drought on ambient concentrations and trends. Richmond, CA: Aquatic Science Center; 2018 . Report No. : 865. Shimabuku I, Pearce S, Trowbridge P, Franz A, Yee D, Salop P. Field Operations Manual for the Regional Monitoring Program. Richmond, CA: San Francisco Estuary Institute; 2018 . Report No. : 902. Lin D, Sutton R, Sun J, Ross J. Screening of Pharmaceuticals in San Francisco Bay Wastewater. Richmond, CA: San Francisco Estuary Institute ; 2018 . Report No. : 910. Lin D, Davis J. Support for Sediment Bioaccumulation Evaluation: Toxicity Reference Values for the San Francisco Bay. Richmond, CA: San Francisco Estuary Institute ; 2018 . Report No. : 916. Yee D, Wong A, Hetzel F. Current Knowledge and Data Needs for Dioxins in San Francisco Bay. Richmond, CA: San Francisco Estuary Institute ; 2018 . Report No. : 926. Lin D, Sutton R. Alternative Flame Retardants in San Francisco Bay: Synthesis and Strategy. Richmond, CA: San Francisco Estuary Institute ; 2018 . Report No. : 885. Melwani A, Yee D, McKee L, Gilbreath A, Trowbridge P, Davis J. Statistical Methods Development and Sampling Design Optimization to Support Trends Analysis for Loads of Polychlorinated Biphenyls from the Guadalupe River in San Jose, California, USA. Livermore, CA: Applied Marine Sciences; 2018 . Report No. : 876. Sedlak M, Sutton R, Wong A, Lin D. Per and Polyfluoroalkyl Substances (PFAS) in San Francisco Bay: Synthesis and Strategy. Richmond, CA: San Francisco Estuary Institute ; 2018 . Report No. : 867. Gilbreath A, Wu J, Hunt J, McKee L. Pollutants of Concern Reconnaissance Monitoring Water Years 2015, 2016, and 2017. Richmond, CA: San Francisco Estuary Institute; 2018 . Report No. : 840. Shimabuku I, Trowbridge P, Salop P. 2018 RMP Bivalve Retrieval Cruise Plan. Richmond, CA: San Francisco Estuary Institute; 2018 . Report No. : 893. Salop P, Franz A. 2018 RMP Sediment Cruise Report. Richmond, CA: San Francisco Estuary Institute ; 2018 . Report No. : 907. Lin D, Sutton R, Shimabuku I, Sedlak M, Wu J, Holleman R. Contaminants of Emerging Concern in San Francisco Bay: A Strategy for Future Investigations 2018 Update. Richmond, CA: San Francisco Estuary Institute; 2018 . Report No. : 873. Franz A, Trowbridge P, Salop P. 2018 RMP Sediment Sampling and Analysis Plan. Richmond, CA: San Francisco Estuary Institute; 2018 . Report No. : 904. Sun J. Non-Targeted Analysis of Water-Soluble Compounds Highlights Overlooked Contaminants and Pathways (Coming Soon). Richmond, CA: San Francisco Estuary Institute; 2018 . Report No. : 905. McKee L, Gilbreath A, Pearce S, Shimabuku I. Guadalupe River Mercury Concentrations and Loads During the Large Rare January 2017 Storm. Richmond, CA: San Francisco Estuary Institute ; 2018 . Report No. : 837. Sun J, Davis J, Stewart R. Selenium in Muscle Plugs of White Sturgeon from North San Francisco Bay, 2015-2017. Richmond, CA: San Francisco Estuary Institute ; 2018 . Report No. : 929. Jahn A. Gut Contents Analysis of Four Fish Species Collected in the San Leandro Bay RMP PCB Study in August 2016. Richmond, CA: San Francisco Estuary Institute; 2018 . Report No. : 900. Jabusch T, Trowbridge P. Microbial Water Quality at Minimally Human-Impacted Reference Beaches in Northern California. Richmond, CA: San Francisco Estuary Institute ; 2018 . Report No. : 858. Sun J, David J, Stewart R, Palace V. Selenium in White Sturgeon from North San Francisco Bay: The 2015-2017 Sturgeon Derby Study - (Coming Soon). Richmond, CA: San Francisco Estuary Institute ; 2018 . Report No. : 897. Yee D, Gilbreath A, McKee L, Davis J. Conceptual Model to Support PCB Management and Monitoring in the San Leandro Bay Priority Margin Unit: Phase Three - (Coming Soon). Richmond, CA: San Francisco Estuary Institute ; 2018 . Report No. : 899. Gilbreath A, McKee L, Hunt J, Yee D. Pollutants of Concern Monitoring: A low-intensity, budget conscious stormwater sampling method to identify highly polluted areas for potential management action . Richmond, CA: San Francisco Estuary Institute ; 2017. Yee D. 2016 RMP Bivalve Samples Quality Assurance Report. Richmond, CA: San Francisco Estuary Institute ; 2017 . Denslow N, Kroll K, Jayasinghe S, Adeyemo O, Lavelle C, Li E, et al.. Linkage of In Vitro Assay Results With In Vivo End Points, Phases 1 and 2. 2017 . Report No. : 823. Anderson B, Phillips B, Voorhees J. The effects of kaolin clay on the amphipod Eohaustorius estuarius: Part Two. 2017 . Report No. : 822. Gilbreath AN, Hunt JA, Yee D, McKee LJ. Pollutants of concern reconnaissance monitoring final progress report, water years 2015 and 2016. 2017 . Report No. : 817. Yee D, Gilbreath AN, McKee LJ, Davis JA. Conceptual Model to Support PCB Management and Monitoring in the San Leandro Bay Priority Margin Unit: Phase I. Richmond, CA: San Francisco Estuary Institute; 2017 . Report No. : 830. Davis JA, Yee D, Gilbreath AN, McKee LJ .. Conceptual Model to Support PCB Management and Monitoring in the Emeryville Crescent Priority Margin Unit. Richmond, CA: San Francisco Estuary Institute; 2017 . Report No. : 824. Yee D, Ross J. San Francisco Bay California Toxics Rule Priority Pollutant Ambient Water Monitoring Report. Richmond: San Francisco Estuary Institute; 2017 . Report No. : 814. Wu J, Gilbreath A, McKee LJ. Regional Watershed Spreadsheet Model (RWSM): Year 6 Progress Report. Richmond, CA: San Francisco Estuary Institute; 2017 . Report No. : 811. Sutton R, Sedlak M. Microplastic Monitoring and Science Strategy for San Francisco Bay. Richmond, Calif.: San Francisco Estuary Institute; 2017 . Report No. : 798. Downing-Kunz M, Schoellhamer D, Work P. Water and Suspended-Sediment Flux Measurements at the Golden Gate, 2016-2017. 2017 . Report No. : 856. Yee D, Wong A, Shimabuku I, Trowbridge P. Characterization of Sediment Contamination in Central Bay Margin Areas. Richmond, CA: San Francisco Estuary Institute; 2017 . Report No. : 829. Yee D, Franz A, Wong A, Ross J, Trowbridge P. 2017 Quality Assurance Program Plan for the Regional Monitoring Program for Water Quality in San Francisco Bay. Richmond, CA: San Francisco Estuary Institute; 2017 . Report No. : 828. Sun J, Davis JA, Bezalel SN, Ross JRM, Wong A, Fairey R, et al.. Contaminant Concentrations in Sport Fish from San Francisco Bay, 2014. 2017 . Report No. : 806. Sun J, Pearce S, Trowbridge P. RMP Field Sampling Report 2016. Richmond, CA: San Francisco Estuary Institute; 2017 . Report No. : 826. De La Cruz S, Woo I, Flanagan A, Mittelstaedt H. Assessing the Impact of Periodic Dredging on Macroinvertebrate-Prey Availability for Benthic Foraging Fishes: Final Study Plan and Preliminary Pilot Study Results. Vallejo, CA: U.S. Geological Survey; 2017 . Report No. : 833. Chen L, Roy S, Rath J, Grieb T. Water Column Selenium Concentrations in the San Francisco Bay-Delta: Recent Data and Recommendations for Future Monitoring. 2017 . Report No. : 836. Lin D, Sun J, Yee D, Franz A, Trowbridge P, Salop P. 2017 RMP Water Cruise Plan. Richmond, CA: San Francisco Estuary Institute ; 2017 . Report No. : 845. Salop P. 2017 RMP Water Cruise Report. Livermore, CA: Applied Marine Sciences; 2017 . Report No. : 846. Fairey R, Sigala M. 2017 Margins Microplastics Cruise Report. Moss Landing, CA: Coastal Conservancy & Research; 2017 . Report No. : 848. Sutton R, Sedlak M, Sun J, Lin D. Contaminants of Emerging Concern in San Francisco Bay: A Strategy for Future Investigations. 2017 Revision. Richmond, CA: San Francisco Estuary Institute; 2017 . Report No. : 815. Sun J, Robinson A, Davis JA, Trowbridge P, A. Stewart R, Palace VP, et al.. Selenium in White Sturgeon Tissues: 2015 Sturgeon Derby. 2017 . Report No. : 834. RMP. 2017 RMP Detailed Workplan and Budget. Richmond, CA: San Francisco Estuary Institute; 2017 . Davis J, Yee D, Fairey R, Sigala M. San Leandro Bay PCB Study Data Report. Richmond, CA: San Francisco Estuary Institute; 2017 . Report No. : 855. Holleman R, Nuss E, Senn D. San Francisco Bay Interim Model Validation Report. Richmond, CA: San Francisco Estuary Institute; 2017 . Report No. : 850. Sedlak M, Sutton R, Box C, Sun J, Lin D. Sampling and Analysis Plan for Microplastic Monitoring in San Francisco Bay and Adjacent National Marine Sanctuaries. Richmond, CA: San Francisco Estuary Institute; 2017 . Report No. : 819. RMP. 2017 RMP Multi-Year Plan. Richmond, CA: San Francisco Estuary Institute; 2017 . Trowbridge P, Sun J, Franz A, Yee D. 2017 Margins Sediment Cruise Plan. Richmond, CA: San Francisco Estuary Institute ; 2017 . Report No. : 847. SFEI. The Pulse of the Bay: The 25th Anniversary of the RMP. Richmond, CA: San Francisco Estuary Institute; 2017 . Report No. : 841. Yee D. 2016 RMP Bird Egg Samples Quality Assurance Report. Richmond, CA: San Francisco Estuary Institute; 2017 . Sutton R, Brown JV. The RMP Emerging Contaminants Program - Fact Sheet. 2016. Sutton R. Microplastic Contamination in San Francisco Bay - Fact Sheet. 2015, Revised 2016. 2016. Melwani AR, Yee D, Gilbreath A, Davis J, McKee L. Optimizing sampling methods for monitoring pollutant trends in San Francisco Bay urban stormwater. Livermore, CA: Applied Marine Sciences; 2016. Sutton R, Sedlak M, Houtz E. Identifying and Addressing Contaminant Sources Impacting an Urban Estuary. 2016. Shimabuku I. 2015 Update to Copper Rolling Average. Richmond, CA: San Francisco Estuary Institute ; 2016. Shimabuku I. 2015 Update to Cyanide Rolling Average. Richmond, CA: San Francisco Estuary Institute ; 2016. Applied Marine Sciences. 2016 RMP Bivalve Deployment Cruise Report. 2016 . SFEI. 2016 RMP Sturgeon Derby Study Sampling & Analysis Plan. Richmond, CA: San Francisco Estuary Institute ; 2016 . Ackerman J, Hartman A, Herzog MP, Toney M. San Francisco Bay Triennial Bird Egg Monitoring Program for Contaminants - 2016 Data Summary. Dixon, CA: U.S. Geological Survey; 2016 p. 19 pp. Hunt J, Trowbridge P, Yee D, Franz A, Davis J. Sampling and Analysis Plan for 2016 RMP Status and Trends Bird Egg Monitoring. Richmond, CA: San Francisco Estuary Institute; 2016 p. 31 pp. Report No. : 827. RMP. 2016 RMP Detailed Workplan and Budget. Richmond, CA: San Francisco Estuary Institue; 2016 . Yee D, Franz A, Wong A, Ross J. 2016 Quality Assurance Program Plan for the Regional Monitoring Program for Water Quality in San Francisco Bay. 2016 . McKee LJ ., Gilbreath AN, Yee D, Hunt JA. Pollutants of concern (POC) reconnaissance monitoring final progress report, water year (WY) 2015. 2016 . Report No. : 787. Wu J, Gilbreath AN, McKee LJ. Regional Watershed Spreadsheet Model (RWSM) Year 5 Progress Report. 2016 . Report No. : 788. Applied Marine Sciences. 2016 RMP Bivalve Retrieval Cruise Report. 2016 . Sun J, Robinson A, Davis JA. Selenium in Sturgeon Muscle Plugs: 2014. 2016 . Ross JRM, Davis JA, Trowbridge P, Sun J, Ackerman JT, Adelsbach T, et al.. Contaminant Concentrations in Eggs of Double-crested Cormorants and Forster's Terns from San Francisco Bay: 2002-2012. 2016 . Report No. : 736. San Francisco Estuary Institute (SFEI). 2016 Regional Monitoring Program Update. Richmond, CA: San Francisco Estuary Institute; 2016 . Report No. : 790. SFEI. 2015 Annual Monitoring Report. Richmond, CA: San Francisco Estuary Institute; 2016 . Report No. : 775. Applied Marine Sciences. 2016 RMP Bivalve Deployment Cruise Plan. 2016 . Applied Marine Sciences. 2016 RMP Bivalve Retrieval Cruise Plan. 2016 . McKee LJ ., Gilbreath AN, Hunt JA, Wu J, Yee D. Sources, Pathways and Loadings: Multi-Year Synthesis with a Focus on PCBs and Hg. 2016 . Report No. : 773. Gilbreath AN, Hunt JA, Wu J, Kim PS, McKee LJ .. Pollutants of concern (POC) loads monitoring progress report, water years (WYs) 2012, 2013, and 2014. 2016 . Report No. : 741. Yee D, Trowbridge P. 2016 Updated ambient concentrations of toxic chemicals in San Francisco Bay area sediments. Richmond, CA: San Francisco Estuary Institute; 2016 . RMP. 2016 RMP Multi-Year Plan. Richmond, CA: San Francisco Estuary Institute; 2016 . Senn D, Dugdale R, Wilderson F, Parker AE, Gilbert PM, Berg M, et al.. Synthesis of Current Science: Influence of Nutrient Forms and Ratios on Phytoplankton Production and Community Composition. Richmond, CA: San Francisco Estuary Institute ; 2016 . Report No. : 862. Baldwin D. Effect of salinity on the olfactory toxicity of dissolved copper in juvenile salmon. 2015. 2015 Water Cruise Site Map. 2015. 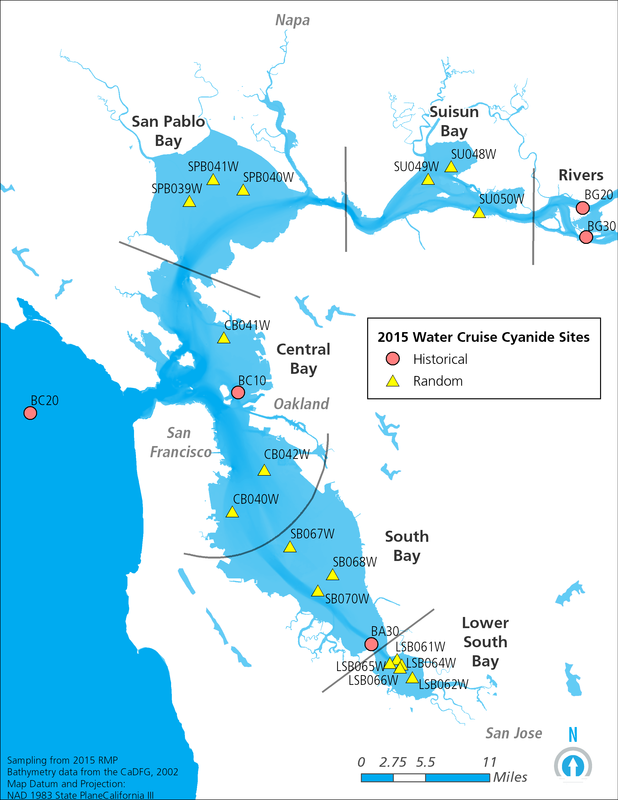 2015 Water Cruise - Cyanide Map. Richmond, CA: San Francisco Estuary Institute ; 2015. SFEI. 2015 Summary of Sturgeon Telemetry Studies in San Francisco Estuary. 2015. Stanek SK, Sutton R, Mason SA, Willis-Norton E, Wren IF, Box C. Microplastic Contamination in San Francisco Bay. 2015 RMP Annual Meeting; 2015. Yee D. Evaluation of Mercury and PCB Trends in San Francisco Bay Region Stormwater. 2015 RMP Annual Meeting; 2015. Novick E, Bresnahan P, Downing-Kunz M, Senn D. Dissolved Oxygen in Sloughs of San Francisco Bay. Richmond, CA; 2015. Gilbreath A. The Regional Watershed Spreadsheet Model: A Tool for Estimating Urban Stormwater Contaminant Loads. 2015. Gilbreath A, Yee D, McKee L, Davis J. PCB Margin Unit Prioritization Final Report. Richmond, CA: San Francisco Estuary Institute; 2015. SFEI. 2015 Pulse of the Bay: The State of Bay Water Quality - 2015 and 2065. Richmond, CA: San Francisco Estuary Institute; 2015 . Report No. : 759. Yee D, Trowbridge P, Sun J. 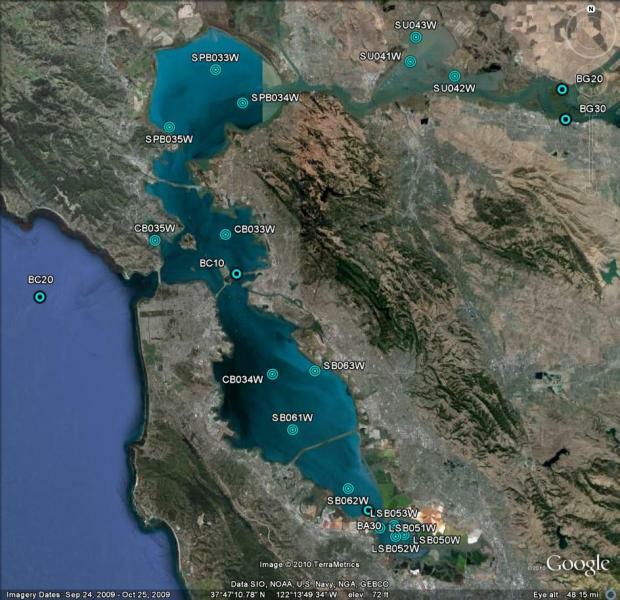 2015 Updated Ambient Concentrations of Toxic Chemicals in San Francisco Bay Sediments. 2015 . Report No. : 749. Yee D. 2014 RMP Sediment Samples Quality Assurance Report. Richmond, CA: San Francisco Estuary Institute; 2015 . Yee D. 2013 RMP Water Samples Quality Assurance Report. Richmond, CA: San Francisco Estuary Institute; 2015 . Applied Marine Sciences. 2015 RMP Water Cruise Report. Livermore, CA: Applied Marine Sciences; 2015 . RMP Lead Scientist. 2015 RMP Artesian Slough Sampling & Analysis Plan. Richmond, CA: San Francisco Estuary Institute; 2015 . Applied Marine Sciences. 2015 RMP Water Cruise Plan. Livermore, CA: Applied Marine Sciences; 2015 . SFEI. 2015 Bay Margins Sediment Study Cruise Plan. 2015 . Sutton R, Kucklick J. A Broad Scan of Bay Contaminants. Richmond, CA: San Francisco Estuary Institute; 2015 . Yee D, Franz A, Jabusch T, Wong A, Ross J. 2015 Quality Assurance Program Plan for the Regional Monitoring Program for Water Quality in San Francisco Bay. Richmond, CA: San Francisco Estuary Institute; 2015 . Anderson B, Phillips B, Voorhees J. The Effects of Kaolin Clay on the Amphipod Eohaustorius estuarius. Davis, CA: Department of Environmental Toxicology, University of California, Davis; 2015 . Report No. : 755. 2015 RMP Detailed Workplan. Richmond, CA: San Francisco Estuary Institute; 2015 . 2015 RMP Multi-Year Plan. Richmond, CA: San Francisco Estuary Institute; 2015 . 2015 RMP Program Plan. Richmond, CA: San Francisco Estuary Institute; 2015 . SFEI. 2015 Sturgeon Muscle Plug Study Sampling & Analysis Plan. Richmond, CA: San Francisco Estuary Institute ; 2015 . Trowbridge P, Davis JA, Wilson R. Charter: Regional Monitoring Program for Water Quality in San Francisco Bay. Richmond, Calif: San Francisco Estuary Institute; 2015 . Report No. : 750. Sutton R, Sedlak M. Contaminants of Emerging Concern in San Francisco Bay: A Strategy for Future Investigations. 2015 Update. Contaminants of Emerging Concern in San Francisco Bay: A Strategy for Future Investigations. Richmond, CA: San Francisco Estuary Institute; 2015 . Report No. : 761. Research CConservati. 2015 RMP Contaminant Concentrations in Central Bay Margins Sediment Cruise Report. 2015 . Yee D. 2014 RMP Bivalve Samples Quality Assurance Report. Richmond, CA: San Francisco Estuary Institute; 2015 . San Francisco Estuary Institute. 2013-2014 Annual Monitoring Results. Richmond, CA: San Francisco Estuary Institute; 2015 . Report No. : 758. RMP, Survey UStates Geo. RMP/USGS Factsheet: Sediment Flux to and from Lower South San Francisco Bay. 2014. David N, Leatherbarrow JE, Yee D, McKee LJ .. Removal efficiencies of a bioretention system for trace metals, PCBs, PAHs, and dioxins in a semiarid environment. Journal of Environmental Engineering. 2014;. Klosterhaus S, Wong A, McKee LJ ., D Y, Kass J. Polychlorinated biphenyls in the exterior caulk of San Francisco Bay Area buildings, California, USA. Environment International. 2014;66:38-43. Copper Site Specific Objective 3-year Rolling Averages Table. 2014. Sutton R, Chen D, Sedlak M. Alternative Flame Retardants in San Francisco Bay. Vancouver Canada; 2014. Applied Marine Sciences. 2013 RMP Water Cruise Plan. Livermore, CA: Applied Marine Sciences; 2014 . Applied Marine Sciences. 2014 RMP Sediment Cruise Report. 2014 . Applied Marine Sciences. 2013 RMP Water Cruise Report. 2014 . Gillett DJ, Ranasinghe JA, Stein ED. Development of Benthic Community Condition Indices – San Francisco Bay. Richmond, CA: San Francisco Estuary Institute; 2014 . McKee LJ ., Gilbreath AN, Gluchowski D, Hunt JA, Wu J. Pollutants of Concern (POC) Loads Monitoring Data Progress Report: Water Years (WYs) 2012 and 2013. Richmond, CA: SFEI; 2014 pp. 1-84. Report No. : 708. Davis JA, McKee LJ ., Jabusch TW, Yee D, Ross JRM. PCBs in San Francisco Bay: Assessment of the Current State of Knowledge and Priority Information Gaps. Richmond, CA: SFEI; 2014 . Report No. : 727. Yee D, Franz A, Jabusch TW, Wong A, Lent M, Eastman R, et al.. 2014 Quality Assurance Program Plan for the Regional Monitoring Program for Water Quality in San Francisco Bay. Richmond, CA: SFEI; 2014 . Applied Marine Sciences. 2014 RMP Bivalve Deployment Cruise Plan. 2014 . Research CConservati. 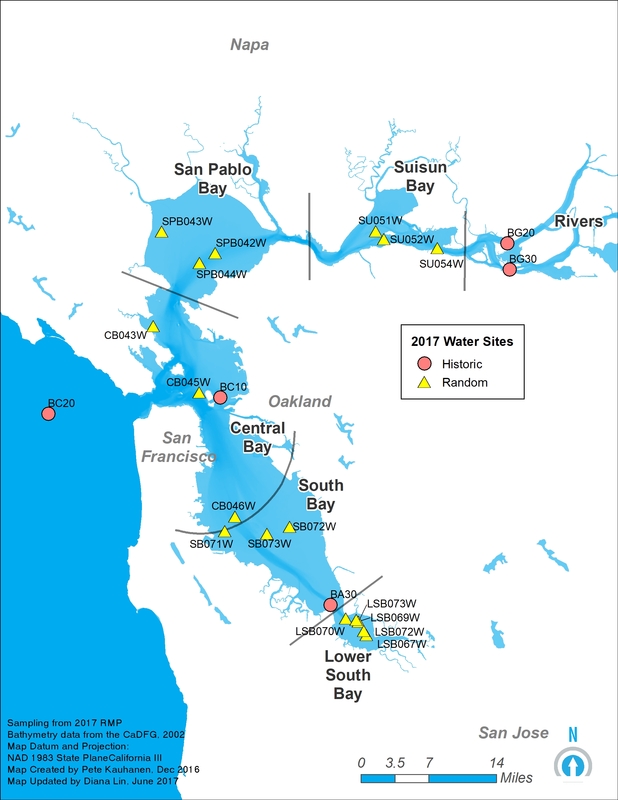 2014 RMP Contaminant Concentrations in San Francisco Bay Sportfish Cruise Report. 2014 . Applied Marine Sciences. 2014 RMP Bivalve Retrieval Cruise Report. 2014 . Jayasinghe S, Kroll K, Adeyemo O, Lavelle C, Denslow N, Mehinto M, et al.. Linkage of In Vitro Assay Results With In Vivo End Points. Richmond, CA: San Francisco Estuary Institute; 2014 . Senn DB, Yee D, Jones C, Novick E, Davis JA. 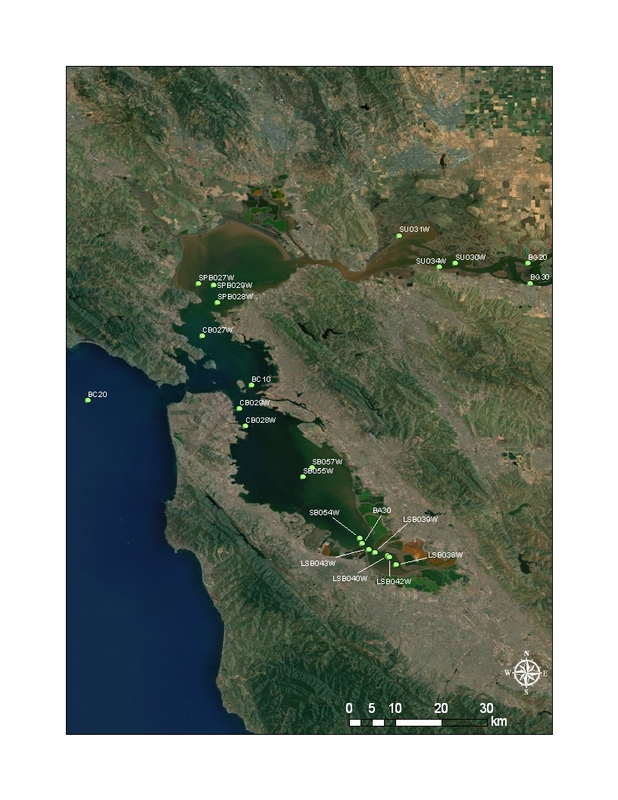 Model Development Plan to Support Nutrient Management Decisions in San Francisco Bay. Richmond, CA; 2014 . Report No. : 705. Sutton R, Sedlak M, Davis JA. Polybrominated Diphenyl Ethers (PBDEs) in San Francisco Bay: A Summary of Occurrence and Trends. Richmond, CA: San Francisco Estuary Institute; 2014 p. 62. Report No. : 713. Grenier JLetitia, Greenfield BK, Jahn A, Ridolfi K, Harrold KH, Ayers S, et al.. Seasonal and annual trends in forage fish mercury concentrations, San Francisco Bay. Science of the Total Environment. 2013;444:591-601. Klosterhaus S, Grace R, Hamilton MC, D Y. Method validation and reconnaissance of pharmaceuticals, personal care products, and alkylphenols in surface waters, sediments, and mussels in an urban estuary. Environment International. 2013;54:92-99. Greenfield BK, Slotton DG, Harrold KH. Predictors of Mercury Spatial Patterns in San Francisco Bay Forage Fish. Environmental Toxicology and Chemistry. 2013;32(12):2728-2737. Weisberg SB, Thompson B, Ranasinghe JA, Lowe S, Melwani A. Benthic macrofaunal assemblages of the San Francisco Estuary and Delta, USA. Environmental Monitoring Assessment. 2013;. Meadows R. Estuary News RMP Insert 2013. Estuary News. Richmond, CA: San Francisco Estuary Institute; 2013;. 2013 Water Cruise - Cyanide Map. Richmond, CA: San Francisco Estuary Institute ; 2013. Copper 2013 Sample Locations Map. 2013. Yee D, Sutton R, Davis JA, Sedlak M. PBDES in the San Francisco Bay Food Web. 2013. SFEI. 2013 Pulse of the Bay: Contaminants of Emerging Concern. Richmond, CA: San Francisco Estuary Institute ; 2013 p. 102. McKee LJ ., Gluchowski DC, Gilbreath AN, Hunt JA. Pollutants of concern (POC) loads monitoring data progress report, water year (WY) 2012. Richmond, CA: SFEI; 2013 . Klosterhaus S, Yee D, Sedlak M, Wong A, Sutton R. Contaminants of Emerging Concern in San Francisco Bay: A Summary of Occurrence Data and Identification of Data Gaps. 2013 p. 121. Report No. : 698. Greenfield BK, Austin C, Blum JD, Davis JA, Brodberg R, Grenier JLetitia, et al.. Reducing methylmercury accumulation in the food webs of San Francisco Bay and its local watersheds. Environmental Research. 2012;119:3-26. Greenfield BK, Allen RM. Polychlorinated biphenyl spatial patterns in San Francisco Bay forage fish. Chemosphere. 2012;. Klosterhaus S, Stapleton HM, La Guardia MJ, Greig D. Brominated and Chlorinated Flame Retardants in San Francisco Bay Sediments and Wildlife. Environment International. 2012;47:56-65. Werme C. Estuary News RMP Insert 2012. Estuary News. Richmond, CA: San Francisco Estuary Institute; 2012;. Anderson P, Denslow N, Drewes J, Olivieri A, Schlenk D, Scott G, et al.. Monitoring Strategies for Chemicals of Emerging Concern (CECs) in California's Aquatic Ecosystems. 2012. Ujihara A. San Francisco Bay Fish Exposure Reduction Project Summary. 2012. Kucklick J. Non-targeted analysis update. Richmond, CA (SFEI); 2012. RMP 2012 Annual Meeting Agenda. 2012. Sedlak M, Davis JA. Contaminants of Emerging Concern: Synthesis and Strategy. 2012. RMP Sport Fish Workgroup Meeting Draft Agenda. 2012. Herbold B. Fish Habitats in Suisun Bay and What Degrades Them. 2012. Monismith S. Hydrodynamic Processes in San Francisco Bay. 2012. Maruya K. A Multiagency Pilot Project on Distribution of Contaminants of Emerging Concern (CECS) In California Coastal Bivalves. 2012. Sedlak M. Contaminants of Emerging Concern: Synthesis and Strategy . 2012. Bannerman R. Modeling Stormwater: A Formula for Success. 2012. Baker J. Contaminant Modeling in San Francisco Bay: Lessons from Other Estuaries. 2012. Fitzpatrick J. Water Quality Modeling in Estuaries: Lessons Learned. 2012. Baldwin D. Olfactory Toxicity of Copper to Salmon in Freshwater and Saltwater. 2012. Davis JA. Reducing Methylmercury in the Food Web of San Francisco Bay. 2012. Oram JJ, Nezlin N. Evaluation of Episodic Suspended Sediment Transport in San Francisco Bay, California through Remote Sensing. Richmond, CA: SFEI; 2012 p. 18. Report No. : 670. Gassel M. Recent Activities/Future Plans: Monitoring Data Needs. 2012 . SFEI. 2011 Pulse of the Estuary: Pollutant Effects on Aquatic Life. Richmond, CA: San Francisco Estuary Institute ; 2012 p. 104. Report No. : 660. Bay SM, Vulpe CD, Loguinov AV, Arai A. Application of Gene Expression Analysis for Sediment Toxicity Stressor Identification. 2012 . Report No. : 659. Allen R, Yee D. Estimated Atmospheric Deposition Fluxes of Dioxins in the San Francisco Estuary. Richmond, CA: SFEI; 2012 . Report No. : 661. Jones C, Yee D, Davis JA, McKee LJ ., Greenfield BK, Melwani AR, et al.. Conceptual Model of Contaminant Fate on the Margins of San Francisco Bay. Richmond, CA: SFEI; 2012 p. 67. Report No. : 663. Klosterhaus S, Allen R, Davis JA. Contaminants of Emerging Concern in the San Francisco Estuary: Alkylphenol Ethoxylates. Richmond, CA: SFEI; 2012 p. 17. Report No. : 657. Lent MA, Gilbreath AN, McKee LJ .. Development of Regional Suspended Sediment and Pollutant Load Estimates for San Francisco Bay Area Tributaries using the Regional Watershed Spreadsheet Model (RWSM): Year 2 Progress Report. Richmond, CA: SFEI; 2012 p. 17. Report No. : 667. Allen R, Klosterhaus S, Davis JA. Contaminants of Emerging Concern in the San Francisco Estuary: Carbamazepine. Richmond, CA: SFEI; 2012 p. 14. Report No. : 658. SFEI. 2012 Regional Monitoring Program Update. 2012 p. 60. McKee LJ ., Gilbreath AN, Hunt JA, Greenfield BK. Pollutants of Concern (POC) Loads Monitoring Data, Water Year (WY) 2011. Richmond, CA: San Francisco Estuary Institute; 2012 . Gilbreath AN, Yee D, McKee LJ .. Concentrations and Loads of Trace Contaminants in a Small Urban Tributary, San Francisco Bay, California. Richmond, CA: SFEI; 2012 p. 40. Report No. : 650. Incardona JP, Linbo TL, Scholz NL. Cardiac toxicity of 5-ring polycyclic aromatic hydrocarbons is differentially dependent on the aryl hydrocarbon receptor 2 isofrom during zebrafish development. Toxicology and Applied Pharmacology. 2011;257:242-249. 2011 Water Cruise - Cyanide Map. Richmond, CA: San Francisco Estuary Institute ; 2011. Copper 2011 Sample Locations Map. 2011. May M. Who's Monitoring What Where? Developing the Central Valley Water Quality Monitoring Inventory. Oakland, CA; 2011. Davis JA, Grenier JLetitia, Yee D, McKee LJ ., Greenfield BK, Looker R, et al.. Reducing Methylmercury Accumulation in the Food Webs of San Francisco Bay and Its Local Watershed. Halifax, Nova Scotia; 2011. Ross J. Dissolved Nitrate and Phosphate Concentrations in San Francisco Estuary Surface Waters: Spatial Distribution (2002-2009) and Temporal Trends (1993-2009). Oakland, CA; 2011. RMP 2011 Annual Meeting Agenda. 2011. Klosterhaus S, Allen R, Davis JA. Contaminants of Emerging Concern in the San Francisco Estuary: Triclosan and Triclocarban. Oakland: SFEI; 2011 . Rattner BA, Lazarus RS, Heinz GH, Karouna-Renier NK, Hale RC. Apparent Tolerance of Common Tern (Sterna hirundo) Embryos to a Pentabrominated Diphenyl Ether Mixture (DE-71). Beltsville, Maryland: USGS-Patuxent Wildlife Research Center; 2011 . Lent MA, McKee LJ .. Development of Regional Suspended Sediment and Pollutant Load Estimates for San Francisco Bay Area Tributaries using the Regional Watershed Spreadsheet Model (RWSM): Year 1 Progress Report. Richmond, CA: SFEI; 2011 p. 126. Report No. : 666. RMP. 2011 Annual Monitoring Results: A report of the Regional Monitoring Program for Water Quality in the San Francisco Estuary. San Francisco Estuary Institute; 2011 . Davis JA, Schiff K, Melwani AR, Bezalel SN, Hunt JA, Allen RM, et al.. Contaminants in Sport Fish from the California Coast, 2009: Summary Report on Year One of a Two-Year Screening Survey. Sacramento: California State Water Resources Control Board; 2011 . Stevens DL. Recommended Methods for Outlier Detection and Calculations of Tolerance Intervals and Percentiles – Application to RMP data for Mercury-, PCBs-, and PAH-contaminated Sediments. Oakland: SFEI; 2011 . San Francisco Estuary Institute. 2009 Annual Monitoring Results. Oakland, CA: San Francisco Estuary Institute; 2011 . Report No. : 629. Lent MA, McKee LJ .. Guadalupe River Watershed Loading HSPF Model: Year 3 final progress report. Richmond, CA: SFEI; 2011 . San Francisco Estuary Institute. RMP Contaminants of Emerging Concern Profile: Triclosan. 2011 . Hintelmann H, Dimock B, Zhu J. DGT (Diffusive Gradient in Thinﬁlm) as a tool to assess sources of bioavailable methylmercury in San Francisco Bay. Oakland: SFEI; 2011 . Report No. : 640. Phillips BM, Anderson BS, Lowe S. RMP Sediment Study 2009-2010 Determining Causes of Sediment Toxicity in the San Francisco Estuary. UC-Davis, Marine Pollutions Studies Laboratory; 2011 . Report No. : 626. Aquatic Science Center. The Pulse of the Delta: Monitoring and Managing Water Quality in the Sacramento - San Joaquin Delta. Oakland, CA: Aquatic Science Center; 2011 . Yee D, McKee LJ ., Oram JJ. A Regional Mass Balance of Methylmercury in San Francisco Bay, California, USA. Environmental Toxicology and Chemistry. 2010;. Kelley KM, Brar NK, Waggoner C, Reyes JA, Fairey R. Evidence for thyroid endocrine disruption in wild ﬁsh in San Francisco Bay, California, USA. Relationships to contaminant exposures. Aquatic Toxicology. 2010;96:203-215. Weisberg SB, Thompson B, Huff DD, Oakden JM, Hyland JL, H. II L, et al.. Habitat-Related Benthic Macrofaunal Assemblages of Bays and Estuaries of the Western United States. Integrated Environmental Assessment and Management. 2010;8(4):638-648. Werme C. Estuary News RMP Insert 2010. Estuary News. 2010;. Copper 2010 Sample Locations Map. 2010. Mumley T. The Municipal Regional Stormwater Permit. Oakland, CA; 2010. Klosterhaus S. Recent studies on the identification an occurrence of PentaBDE replacement chemicals in indoor and outdoor environments. Kyoto, Japan; 2010. Ridolfi K. Assessing Impairment of Wildlife by Mercury in Tomales Bay. Berkeley, CA; 2010. Davis JA. The RMP Mercury Strategy: Approaching a Crossroads. Berkeley, CA; 2010. Collins JN, Goodman-Collins DDarcie, Stalker J. Data Collection Protocol Plant Community Structure of Intertidal--Upland Ecotone. 2010. Yee D. A Simple MeHg mass budget for SF Bay Context and extrapolation of dredged material/wetland contribution. Oakland, Ca; 2010. Schueler T. Emerging Stormwater Pollutant Reduction Strategies from Another Urban Watershed: Importing Some Ideas from the Chesapeake Bay. Oakland, CA; 2010. Schiff K. Lessons from Watershed Monitoring in Southern California. Oakland, CA; 2010. RMP 2010 Annual Meeting Agenda. 2010. Grossinger RM. Linkages Between Watersheds and the Bay: Past, Present, and Future. Oakland, CA; 2010. Prickett L. Low Impact Development: Implementation Examples and New Directions. Oakland, CA; 2010. McKee LJ . Recent Advances in Bay Area Stormwater Science. Oakland, CA; 2010. Allen R. Evaluating Potential Pathways of Perfluorinated Compounds to San Francisco Bay. 2010. Lent MA, Oram JJ, McKee LJ .. Guadalupe River Watershed Model: Support tool for regional Hg and PCB management. 2010. Davis JA. Review of Agenda and Goals of Meeting. Berkeley, CA; 2010. Melwani AR, Greenfield BK, Byron E. Empirical Estimation of Biota Exposure Range for Calculation of Bioaccumulation Parameters. Portland, OR; 2010. Sansalone J. Myths, Models, and Monitoring for Rainfall-Runoff Controls. Oakland, CA; 2010. Sansalone J. Myths, Models, and Monitoring for Rainfall-Runoff Controls. 2010. McKee LJ . Recent Advances in Bay Area Stormwater Science. 2010. Prickett L. Low Impact Development: Implementation Examples and New Directions. 2010. Sommers C. The RMP Small Tributary Loading Strategy. 2010. Taberski K. SWAMP: Monitoring the Health of Our Watersheds. 2010. Klosterhaus S. Update on Contaminants of Emerging Concern. 2010. Schueler T. Emerging Stormwater Pollutant Reduction Strategies from Another Urban Watershed: Importing Some Ideas from the Chesapeake Bay. 2010. Schiff K. Lessons from Watershed Monitoring in Southern California . 2010. Klosterhaus S. Update on Contaminants of Emerging Concern. Oakland, CA; 2010. Mumley T. The Municipal Regional Stormwater Permit. 2010. Grossinger R. Linkages Between Watersheds and the Bay: Past, Present, and Future. 2010. Grenier JLetitia, Greenfield BK, Slotton D, Ayers S. North Bay Small Fish Mercury Monitoring with a Focus on Napa-Sonoma Managed Ponds and Sloughs. 2010 . Greenfield BK, Jahn A. Mercury in San Francisco Bay forage fish. Oakland, Ca: San Francisco Estuary Institute; 2010 . McKee LJ ., Hunt JA, Greenfield BK. Concentrations and Loads of Mercury Species in the Guadalupe River, San Jose, California: Water Year 2010. Oakland: San Francisco Estuary Institute; 2010 . SFEI. 2010 Pulse of the Estuary: Linking the Watersheds and the Bay. Oakland, CA: San Francisco Estuary Institute ; 2010 p. 96. Report No. : 618. McKee LJ ., Yee D. Concentrations of PCBs and Hg in soils, sediments and water in the urbanized Bay Area: Implications for best management. 2010 . Report No. : 608. Eagles-Smith C, Ackerman J. Developing Impairment Thresholds for the Effects of Mercury on Forster's Tern Reproduction in the San Francisco Bay. Davis, CA: U. S. Geological Survey; 2010 . Klosterhaus S. Procedures for the Collection and Storage of Environmental Samples in the RMP Specimen Bank. Oakland, CA: San Francisco Estuary Institute; 2010 . Melwani AR, Lent M, Greenfield BK, McKee LJ .. Optimizing sampling methods for pollutant loads and trends in San Francsico Bay urban stormwater monitoring. Oakland, CA: San Francisco Estuary Institute; 2010 . Greenfield BK, Klatt M, E. LJ, McKee LJ .. Exploratory categorization of watersheds for potential stormwater monitoring in San Francisco Bay. Oakland, CA: San Francisco Estuary Institute; 2010 . Kelley KM, Reyes JA. Characterization Studies of a Thyroid Endocrine-disrupted Condition in Wild Fishes of San Francisco Bay. Oakland: SFEI; 2010 p. 64. Report No. : 644. Stapleton H, Blum A, Webster TF, Klosterhaus S, Eagle S, Fuh J, et al.. Detection of Organophosphate Flame Retardants in Furniture Foam and U.S. House Dust. Environmental Science and Technology. 2009;:7490–7495. Ackerman J, Eagles-Smith C. Integrating Toxicity Risk in Bird Eggs and Chicks: Using Chick Down Feathers To Estimate Mercury Concentrations in Eggs. Environmental Science and Technology. 2009;43:2166-2172. Werme C, Klosterhaus S. Estuary News RMP Insert 2009. Estuary News. 2009;. Copper 2009 Sample Locations Map. 2009. Klosterhaus S. Organophosphate Flame Retardants in San Francisco Bay Biosolids and Sediments. New Orleans, LA; 2009. Cohen AN. How Bioinvasions Have Changed the Benthic Community; and a Recent Oyster Invasion. Oakland, Ca; 2009. McGrath J. Sediment Happens - But not so Much. Oakland, Ca; 2009. Yee D. Analysis of Sediment Cores: Uncovering the Past. Oakland, Ca; 2009. Greenfield BK. Patterns in Mercury Update by Small Fish. Oakland, Ca; 2009. Cloern J. Recent Trends of Phytoplankton Increase in San Francisco Bay. Oakland, Ca; 2009. Grosso C, Bezalel SN, Oram JJ, Featherston T, Ross JRM, Sedlak M, et al.. Environmental Data Upload and Visualization Tools. Oakland, Ca; 2009. Davis JA. Water Quality in the Bay: 2009. Oakland, Ca; 2009. Klosterhaus S, Davis EF, Stapleton HM. Organophosphate Flame Retardants in San Francisco Bay Biosolids and Sediments. New Orleans, LA; 2009. Klosterhaus S. Contaminants of Emerging Concern: An Update on RMP Activities. 2009. Schoellhamer D. Suspended Sediment: Past a Tipping Point – What’s Next?. Oakland, Ca; 2009. Klosterhaus S. Detection of Organophosphate Flame Retardants in Furniture Foam and US House Dust and Indoor Air. Ottawa, Ontario, Canada; 2009. Mumley T. Regulation of Sediment and Sediment Quality. Oakland, Ca; 2009. Klosterhaus S. Alternative Brominated Flame Retardants in San Francisco Bay Wildlife and Sediments. 2009. Klosterhaus S. Flame Retardant Chemicals in San Francisco Bay: More than Just PBDEs. Oakland,Ca; 2009.
van Bergen S, Yee D, Hammond D, Helm W, Rattonetti T. A Legacy of Contaminants in SF Bay and Wetland Cores. Oakland, Ca; 2009. Klosterhaus S. Emerging Problems? Identifying Contaminants of Concern in San Francisco Bay. 2009. Klosterhaus S. Flame Retardant Chemicals in San Francisco Bay: More Than Just PBDEs. Oakland, Ca; 2009. Klosterhaus S. Contaminants of Emerging Concern: An Update on RMP Activities. Oakland, Ca; 2009. Klosterhaus S. Characterization of Organophosphorus Chemicals in a PentaBDE Replacement Mixture and their Detection in Biosolids. Ottawa, Ontario, Canada; 2009. Lent MA, Oram JJ, McKee LJ .. Guadalupe Watershed Model Support Tool for Regional Hg and PCBs Management. Oakland, Ca; 2009. Eagles-Smith C, Ackerman J. Mercury-Selenium Effects on Reproductive Success of Forster's Terns in San Francisco Bay. Davis, California: USGS; 2009 p. 26. Lent MA, Oram JJ, McKee LJ .. Guadalupe Watershed Model Year 1 Report. Oakland, CA; 2009 . McKee LJ ., Gilbreath AN. Concentrations and Loads of Trace Contaminants in the Zone 4 Line A Small Tributary, Hayward, California: Water Year 2007. Oakland,Ca: San Francisco Estuary Institute; 2009 . Report No. : 563. Eagles-Smith C, Hunt J, Ackerman J, Davis JA, Sedlak M. San Francisco Bay Triennial Bird Egg Monitoring Program for Contaminants - 2009 Data Summary. Davis, CA: U. S. Geological Survey; 2009 . McKee LJ ., Feng A, Sommers C, Looker R. RMP Small Tributaries Loading Strategy. Richmond, CA: San Francisco Estuary Institute; 2009 . San Francisco Bay Sport Fish Monitoring, 2009 and Beyond. 2009 . Harrold KH, Yee D, Sedlak M, Klosterhaus S, Davis JA, Woudneh M, et al.. Pharmaceuticals and Personal Care Products in Wastewater Treatment Plant Influent and Effluent and Surface Waters of Lower South San Francisco Bay. Oakland, Ca: San Francisco Estuary Institute; 2009 . SFEI. 2009 Pulse of the Estuary: Bay Sediments - Past a Tipping Point. Oakland, CA: San Francisco Estuary Institute; 2009 p. 92. Report No. : 583. Kelley KM, Reyes JA. Environmental Endocrine Disruption in Wild Fish of San Francisco Bay. Oakland: SFEI; 2009 p. 128. Report No. : 643. Thompson B, Melwani AR, Hunt JA. Estimated Sediment Contaminant Concentrations Associated with Biological Impacts at San Diego Bay Cleanup Sites. Oakland, Ca: San Francisco Estuary Institute; 2009 . Report No. : 584. Werme C. Endocrine-Disrupting Chemicals: Surveillance Using Bay Fish. 2009. Mussels - Miesmuscheln Mytilus. 2008. Connor MS, Davis JA. The State of San Francisco Bay: Water Quality. National Water Quality Monitoring Conference. University of California Santa Cruz; 2008. Oram JJ, McKee LJ ., Grace R, Werme C, Connor MS, Rodigari F, et al.. A Mass Budget of Polybrominated Diphenyl Ethers in San Francisco Bay, CA. Environment International. 2008;. Weisberg SB, Word JQ, Velarde RG, Reish DJ, Oliver J, Diener D, et al.. The level of agreement among experts applying best professional judgment to assess the condition of benthic infaunal communities. Ecological Indicators: Integrating, Monitoring, Assessment and Management. 2008;8:389-394. Williams M, Martin G, Oram J. Estuary News RMP Insert 2008. Estuary News. 2008;. Yee D, McKee LJ ., Oram JJ. A First-Order Mass Budget for Methylmercury in San Francisco Bay, CA. Tampa, FL; 2008. Yee D. A Methylmercury Budget for San Francisco Bay. 2008. McKee LJ . Advances in Understanding of Loads of Mercury and Other Pollutants to the Bay. Oakland, Ca; 2008. Looker R. The San Francisco Bay Water Board's Regulatory Approach and Information Needs. 2008. Goldbeck S. Dredging and Sediment Management in San Francisco Bay. 2008. Fikslin T. Water Quality Science and Management in the Delaware Estuary. 2008. Greenfield BK. The RMP Mercury Strategy: Studies Underway. 2008. Sedlak M, Greig D, Grace R, Riley P. Perfluorinated Compounds in San Francisco Bay Harbor Seals. Tampa, FL; 2008. Lent MA, Oram JJ, McKee LJ .. Guadalupe Watershed Model. Phase: 1 Hydrology Model. Oakland, CA; 2008. Klosterhaus S, Sedlak M, Harrold KH. Emerging Problems? progress of Identifying Contaminants of Concern in the San Francisco Estuary. 2008. Oram JJ. Cool New Tools for Accessing RMP Data. 2008. Davis JA. The RMP Mercury Strategy. Oakland, Ca: RMP Mercury Coordination Meeting; 2008. Connor M. The Implications of Sediment Quality Objectives for San Francisco Bay Management. Berkeley, Ca; 2008. Greenfield BK, Connor MS, Bay SM. Frameworks to evaluate human health impacts of contaminated sediments. Berkeley, Ca; 2008. Klosterhaus S, Davis JA, Sedlak M, Riley P, Harrold KH, Dunlavey E, et al.. Pharmaceutical Concentrations in Influent and Effluent from Two Wastewater Treatment Plants and in Lower South San Francisco Bay. Berkeley CA; 2008. Greenfield BK, Lowe S. The science behind the Sediment Quality Objectives program for California bays and estuaries. Berkeley, Ca; 2008. Stapleton H, Konstantinov A, Klosterhaus S. Characterization of the brominated chemicals in a PentaBDE replacement mixture and their detection in biosolids collected from two San Francisco Bay Area WWTPs. University of California, Berkeley; 2008. Wood M. Mercury Management in the Delta. 2008. Thompson B. Relationships among SQO indicators in San Francisco Bay and continuing development of methods. Berkeley, Ca; 2008. Sedlak M. San Francisco Estuary Pilot Study -- Summary of Gap Analysis. Atlantic City, NJ; 2008. San Francisco Estuary Institute. RMP Newsletter Spring 2008. 2008. Connor M, Flegal AR, Davis JA. The State of San Francisco Bay: Water Quality. 2008 . Phillips BM, Anderson B, Lowe S, Hunt J. RMP Sediment TIE Study 2007-2008: Using Toxicity Identification Evaluation (TIE)Methods to Investigate Causes of Sediment Toxicity to Amphipods. Oakland, CA: San Francisco Estuary Institute; 2008 . Report No. : 561. Thompson B, Lowe S. Sediment Quality Assessments in the San Francisco Estuary. Oakland, Ca: San Francisco Estuary Institute; 2008 . Report No. : 574. Oram JJ, Davis JA. A Forecast Model of Long-Term PCB Fate in San Francisco Bay. Oakland, CA: SFEI; 2008 p. 52. Jahn A. RMP Food Web Analysis; Data Report on Gut Contents of Four Fish Species. San Francisco Estuary Institute; 2008 . Hunt JA, Davis JA, Greenfield BK, Melwani AR, Fairey R, Sigala M, et al.. Contaminant Concentrations in Sport Fish from San Francisco Bay, 2006. Oakland,CA; 2008 . Report No. : 554. Lowe S, Harrold KH, Connor M, Williams M, Kerkering H, Farrarr C, et al.. San Francisco Estuary National Water Quality Monitoring Network Pilot Study Report. 2008 p. 70. Report No. : 548. Melwani AR, Greenfield BK, Jahn A, Oram JJ, Sedlak M, Davis JA. Power Analysis and Optimization of the RMP Status and Trends Program. 2008 . Report No. : 555. SFEI. 2008 Pulse of the Estuary: Monitoring and Managing Water Quality in the San Francisco Estuary. Oakland, CA: San Francisco Estuary Institute; 2008 . Report No. : 559. Yee D. Mercury and Methylmercury in North Bay Tidal Marshes. Oakland,Ca: RMP Mercury Coordination Meeting; 2008 . Melwani AR, Thompson B. The Influence of Chemical and Physical Factors on Macrobenthos in the San Francisco Estuary. 2008 . Report No. : 543. Oram JJ, McKee LJ ., Davis JA, Sedlak M, Yee D. Sources, Pathways and Loadings Workgroup: Five-Year Workplan (2008-12). Oakland: San Francisco Estuary Institute; 2008 . Report No. : 567. Oram JJ, Hunt J. PBDEs in the Bay: Rapid Rise, Rapid Fall?. 2008. NOAA. San Francisco Bay, CA: Comprehensive ecosystem evaluation needed to discern causes of chlorophyll a increases. In 2007 National Eutrophication Assessment. Washington, D.C; 2007. pp. 113-114. Oram JJ, McKee LJ ., Davis JA, Hetzel F. Polychlorinated biphenyls (PCBs) in San Francisco Bay. Environmental Research. 2007;105:67-86. Ross JRM, Flegal AR, Buck KN, Bruland KW. A review of total dissolved copper and its chemical speciation in San Francisco Bay, California. Environmental Research. 2007;105:5-19. Anderson B, Taberski K, Carr RS, Hunt J, Phillips BM, Thompson B, et al.. Patterns and trends in sediment toxicity in the San Francisco Estuary. Environmental Research. 2007;105(1):145-155. Ross JRM, Flegal AR, Brown CL, Squire S, Scelfo GM, Hibdon S. Spatial and temporal variations in silver contamination and toxicity in San Francisco Bay. Environmental Research. 2007;105:34-52. Lowe S, Anderson B, Phillips BM, Hunt J, Taberski K, Carr RS, et al.. Patterns and trends in sediment toxicity in the San Francisco Estuary. Environmental Research. 2007;105:145-155. Oram JJ, Hoenicke R, Taberski K, Oros DR. Adapting an ambient monitoring program to the challenge of managing emerging pollutants in the San Francisco estuary. Environmental Research. 2007;105:132-144. Thompson B, Spies RM, Ohlendorf H, Neale J, Kuwabara J, Hunt JA, et al.. Biological Effects of Anthropogenic Contaminants in the San Francisco Estuary. Environmental Research. 2007;105:156-174. Yee D, Grieb T, Mills W, Sedlak M. Synthesis of long-term nickel monitoring in San Francisco Bay. Environmental Research. 2007;105:20-33. Schoellhamer DH, Mumley TE, Leatherbarrow JE. Suspended sediment and sediment-associated contaminants in San Francisco Bay. Environmental Research. 2007;105:119-131. Oram JJ, Greenfield BK, Davis JA, Werme C, Connor MS, Gunther A, et al.. The slow recovery of the San Francisco Estuary from the legacy of organochlorine pesticides. Environmental Pollution. 2007;. Looker R, Ross JRM, Flegal AR, Conaway CH, Mason RP. Decadal mercury trends in San Francisco Estuary sediments. Environmental Research. 2007;105:53-66. Davis JA, Connor MS, Flegal AR, Conaway CH. Sources, transport, fate and toxicity of pollutants in the San Francisco Bay estuary. Environmental Research : A Multidisciplinary Journal of Environmental Sciences, Ecology and Public Health. 2007;105:1-4. Hunt J, Sedlak M, Reyes J, Kalman J, Kelley K, Eagles-Smith C, et al.. Estuary News RMP Insert 2007. Estuary News. 2007;. Yee D, Lowe S, Grosso C, Ross JRM, Franz A, Stevanovic P. Environmental Data Management Evaluating Internal Performance. Oakland, Ca; 2007. Oram JJ, Davis JA. Modeling the long-term fate of polychlorinated biphenyls in San Francisco Bay, CA. Milwaukee, WI; 2007. Klosterhaus S. Emerging Problems? Progress on Identifying Contaminants of Concern in San Francisco Estuary. 2007. Klosterhaus S. Emerging Problems. Progress on Identifying Contaminants of Concern. Oakland, Ca; 2007. Yee D, Lowe S, Ross JRM, Scelfo GH, Conaway C, Olund SD. 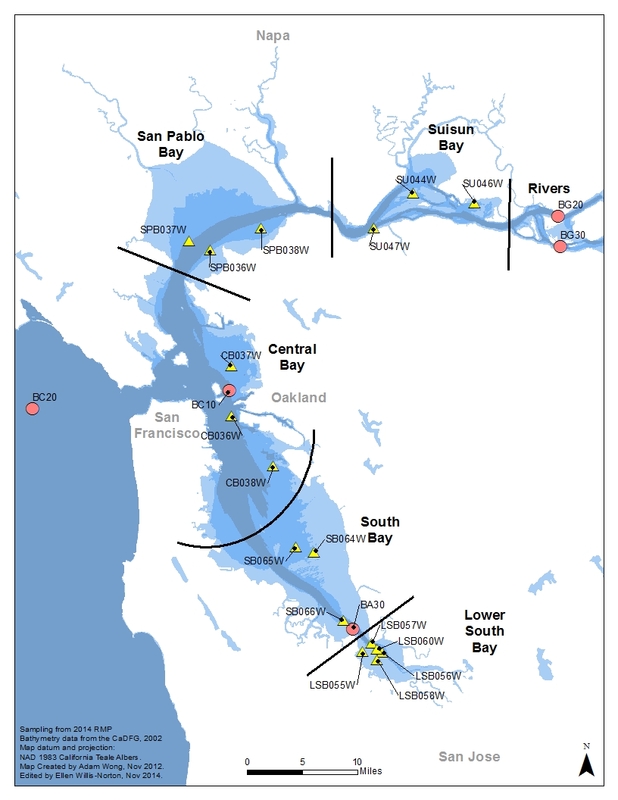 Methylmercury in Bay and Wetland Sediments of the San Francisco Bay Region. 2007. Collins JN. Monitoring the Water Quality Impacts of Wetland Restoration. 2007. Davis JA, Connor MS, Flegal AR. The State of San Francisco Bay: Water Quality. Oakland,Ca; 2007. Sedlak M, Greig D, Grace R, Riley P. Perfluorinated Compounds in San Francisco Bay Harbor Seals. Milwaukee, WI; 2007. Oram JJ, McKee LJ ., Werme C, Connor M, Oros DR. A Mass Budget of PBDEs in SF Bay. 2007. Oram JJ, Davis JA. Improved forecasting for PCBs in San Francisco Bay. Oakland, Ca; 2007. SFEI. 2007 Pulse of the Estuary: Monitoring and Managing Water Quality in the San Francisco Estuary. Oakland, CA: San Francisco Estuary Institute; 2007 p. 88. Report No. : 532. Spies RB, Springman K. A Pilot Study of the Effects of Contaminants on surfperch (Cymatogaster aggregata) in the San Francisco Bay Estuary. San Francisco Estuary Institute; 2007 . Ross JRM, Spies RM, Oros DR, Mumley T. Polycyclic aromatic hydrocarbon (PAH) contamination in San Francisco Bay: A 10-year retrospective of monitoring in an urbanized estuary. Environmental Research. 2006;105:101-118. McKee LJ ., Ganju N, Schoellhamer DH. Estimates of suspended sediment entering San Francisco Bay from the Sacramento and San Joaquin Delta, San Francisco Bay, California. J. of Hydrology. 2006;. Hunt J, Davis JA, Lowe S. Estuary News RMP Insert 2006. Estuary News. 2006;. 2006 Collection /Analysis Summary. 2006. Grosso C, Ross JRM, Franz A, Lowe S, Jr. DLStevens. Using a Spatially Balanced, Random Sampling Design to Assist Informed Management Decisions. San José McEnery Convention Center; 2006. McKee LJ ., David N, Leatherbarrow JE. Riverine Transport of Sediment and Mercury to North San Francisco Bay. 2006. Lowe S, Ross JRM, Franz A, Stevanovic P, Yee D, Grosso C. Facilitating the Exchange and Reporting of Monitoring Data. San José McEnery Convention Center; 2006. Ross JRM, Oros DR. Toxic Potential of PAHs in San Francisco Estuary Sediments. 2006. Yee D. Components of Variability in Long Term Regional Monitoring Program Data. San José McEnery Convention Center; 2006. Lowe S, Anderson B, Phillips BM, Grosso C, Ross JRM, Franz A, et al.. Characterizing Sediment Contamination and Potential Ecological Effects in Six Tributaries of the San Francisco Bay Estuary. 2006. Sedlak M, Yee D, Davis JA, Oros DR, Rodigari F, van Bergen S, et al.. Polybrominated Diphenyl Ethers in San Francisco Estuary. 2006. Oram JJ, Greenfield BK, Davis JA, Leatherbarrow JE. Modeling the fate of organic contaminants in San Francisco Bay, CA. San José McEnery Convention Center; 2006. Final Catch List with Comments. 2006. McKee LJ ., David N, Leatherbarrow JE. Mercury Transport to San Francisco Bay Through the Sacramento-San Joaquin River Delta. San José McEnery Convention Center; 2006. Davis JA, SFEI. 2006 Pulse of the Estuary: Monitoring and Managing Water Quality in the San Francisco Estuary. Oakland, CA: San Francisco Estuary Institute; 2006 p. 82. Report No. : 517. Oram JJ, Greenfield BK, Davis JA, David N, Leatherbarrow JE. Organochlorine Pesticide Fate in San Francisco Bay. Oakland, CA: San Francisco Estuary Institute; 2006 p. 48. Report No. : 433. Oram JJ, Melwani AR. Dredging Impacts on Food-Web Bioaccumulation of DDTs in San Francisco Bay, CA. Oakland, CA: San Francisco Estuary Institute; 2006 . Report No. : 418. SFEI. The 2004 to 2005 RMP Annual Monitoring Results. San Francisco Estuary Institute; 2006 p. 220. Report No. : 519. Greenfield BK, Shonkoff S, Jahn A, Grenier JLetitia, Sandheinrich M. Mercury in biosentinel fish in San Francisco Bay: First-year project report. 2006 . Report No. : 520. Davis JA, Hunt JA, Greenfield BK, Sigala M, Crane D, Regalado K, et al.. Contamination Concentrations in Fish from San Francisco Bay, 2003. San Francisco Estuary Institute; 2006 . Report No. : 432. Davis JA, Flegal AR, Taberski K, Buchan K, Tucker D, Gunther AJ. The Regional Monitoring Program: Science in Support of Managing Water Quality in San Francisco Bay. 2006 . Report No. : 435. 2005 Pulse of the Estuary Fact Sheet. 2005. p. 2. Conaway C, Hibdon S, Flegal R, Sanudo-Wilhelmy SA, Scelfo GH. A Review of Factors Influencing Measurements of Decadal Variations in Metal Contamination in San Francisco Bay, California. Ecotoxicology, 1-16. 2005;:16. Oros DR. Emerging Contaminants: Endocrine Disrupting Chemicals (EDCs). RMP Regional Monitoring News, San Francisco Estuary Regional Monitoring Program for Trace Substances. 2005;10:p.1-11. Hunt J, Spies R, Springman K, Oros D. Estuary News RMP Insert 2005. Estuary News. 2005;. Hunt J, McKee LJ ., Leatherbarrow J, Oros DR. Estuary News RMP Insert 2004/2005. Estuary News. 2005;. Hunt JA. Legacy and Emerging Contaminants in San Francisco Bay Sport Fish, 2003. Henry J. Kaiser Convention Center; 2005. McKee LJ ., David N, Leatherbarrow JE. Mercury transport to San Francisco Bay through the Sacramento-San Joaquin River Delta. 2005. Davis JA. Monitoring Legacy and Emerging Pollutants at the Top of the San Francisco Bay Food Web. Henry J. Kaiser Convention Center, Oakland, CA; 2005. Lowe S, Grosso C, Ross JRM, Franz A, Stevens DL. Using a Spatially Balanced, Random Sampling Design to Assist Informed Management Decision. Henry J. Kaiser Convention Center, Oakland California; 2005. Yee D. Methylmercury in San Francisco Bay Surface Sediments. Henry J. Kaiser Convention Center; 2005. Oram JJ, Leatherbarrow JE, Davis JA. DRAFT REPORT: A Model of Long-Term PCB Fate and Transport in San Francisco Bay, CA. Oakland, CA: San Francisco Estuary Institute; 2005 . Report No. : 388. Davis JA. Regional Monitoring Program for Trace Substances in the San Francisco Estuary 2005 Program Plan. Oakland: San Francisco Estuary Institute; 2005 p. 16. Report No. : 389. SFEI. 2005 Pulse of the Estuary: Monitoring and Managing Water Quality in the San Francisco Estuary. Oakland, CA: San Francisco Estuary Institute; 2005 p. 84. Report No. : 78. McKee LJ . Sources, Pathways, and Loadings: 5-Year Work Plan (2005-2009). San Francisco Estuary Institute; 2005 p. 25. Report No. : 406. Salop P, Hardin D, Bemis B. Optimizing Transplanted Bivalve Studies for the Regional Monitorig Program for Trace Substances. Applied Marine Sciences. San Francisco Estuary Institute; 2005 . Report No. : 431. San Francisco Estuary Institute. 2003 Annual Results: San Francisco Estuary Regional Monitoring Program for Trace Substances. Oakland, CA: San Francisco Estuary Institute; 2005 . Report No. : 398. Hoenicke R, Yee D, Tsai P, Bamford HA, Baker J. San Francisco Bay Atmospheric Deposition Pilot StudyPart 3: Dry Deposition of PAHs and PCBs. 2005 . Report No. : 408. Yee D, Ross JRM, David N, Leatherbarrow JE. Fate of Contaminants in Sediment of San Francisco Estuary: A Review of Literature and Data - Final Report. Oakland: San Francisco Estuary Institute; 2005 . Report No. : 394. McKee LJ ., Flegal AR, Ganju N, Leatherbarrow JE, Schoellhamer DH. Concentratons and Loads of Organic Contaminants and Mercury associated with Suspended Sediment Discharged to San Francisco Bay from the Sacramento-San Joaquin River Delta, CA. San Francisco Estuary Institute; 2005 . Report No. : 405. Hoenicke R, Tsai P, Bamford HA, Baker J, Yee D. San Francisco Bay Atmospheric Deposition Pilot Study Part 3: Dry Deposition of PAHs and PCBs. 2005 . Report No. : 506. Lowe S, Hoenicke R, Taberski K, Smith R, Thompson B, Stevens D, et al.. Re-design Process of the San Francisco Estuary Regional Monitoring Program for Trace Substances (RMP) Status & Trends Monitoring Component for Water and Sediment. Oakland, CA: San Francisco Estuary Institute; 2005 . Report No. : 507. Ross JRM, Oros DR. Polycyclic aromatic hydrocarbons in San Francisco Estuary sediments. Marine Chemistry. 2004;86:169-184. Conaway CH, Watson E, Flanders JR, Flegal AR. Assessing Historic Mercury Concentrations in Sediments, San Francisco Bay Estuary. 2004;. Greenfield BK, Davis JA, Fairey R, Crane D, Ichikawa G, Roberts C. Seasonal, Interannual, and Long-term Variation in sport fish contamination, San Francisco Bay. Science of the Total Environment. 2004;. Greenfield BK, Davis JA, Slotton DG, Ayers SM, Ichikawa G, Stephenson M, et al.. Mercury Contamination of Sport Fish in the Delta and its Tributaries. Richmond, CA: San Francisco Estuary Institute; 2004. Davis JA, Fairey R, Crane D, Ross JRM, Ichikawa G, Roberts C, et al.. Cisnet Technical Report: Contaminant Accumulation in Forage Fish. San Francisco Estuary Institute; 2004 . Report No. : 413. Greenfield BK, Davis JA. A Simple Mass Balance Model for PAH Fate in the San Francisco Estuary. Oakland, CA: San Francisco Estuary Institute; 2004 . Report No. : 115. Greenfield BK, Davis JA, Crane D, Ross JRM, Ichikawa G, Spautz H, et al.. Cisnet Technical Report: Contaminant Accumulation In Eggs of Double-Crested Cormorants and Song Sparrows In San Pablo Bay. San Francisco Estuary Institute; 2004 . Report No. : 412. Davis JA. 2004 RMP Program Plan. 2004 . San Francisco Estuary Institute. 2002 Annual Results. 2004 . Report No. : 318. Davis JA, Lowe S, Anderson B, Hunt J, Thompson B. Conceptual Framework and Rationale for the Exposure and Effects Pilot Study. Oakland: San Francisco Estuary Institute; 2004 . Report No. : 317. Lowe S, Ross JRM, David N, Hunt J, Oros DR, Leatherbarrow JE, et al.. San Francisco Estuary Regional Monitoring Program (RMP) Annual Monitoring Results, 2002. Oakland, CA: San Francisco Estuary Institute; 2004 . Report No. : 466. Lowe S, Hoenicke R, Taberski K, Smith R, Thompson B, Stevens D, et al.. Re-design Process of the San Francisco Estuary Regional Monitoring Program for Trace Substances (RMP). Oakland, CA: San Francisco Estuary Institute; 2004 . Report No. : 109. Berger R, Conomos J, Herrgesell P, Mearns A, Schubel JR, Weisberg S. Report of the 2003 Program Review. Oakland: San Franciso Estuary Institute; 2004 . Report No. : 303. Davis JA, Lowe S, David N, Oros DR, Jarman WM, Lowe T. Surveillance for previously unmonitored organic contaminants in the San Francisco Estuary. Marine Pollution Bulletin. 2003;46(9):1102-10. Lowe S, David N, Oros DR, Jarman WM, Lowe T, Davis JA. Surveillance for previously unmonitored organic contaminants in the San Francisco Estuary. Marine Pollution Bulletin. 2003;46:1102-1110. Hoenicke R, Mumley TE, Gunther A, Taberski K, Abu-Saba KE, Davis JA. Effective Application of Monitoring Information: The Case of San Francisco Bay. Environmental Monitoring and Assessment. 2003;81:15-25. Flegal AR, Steding DJ. Mercury concentrations in coastal California precipitation: Evidence of local and trans-Pacific fluxes of mercury to North America. Journal of Geophysical Research - Atmospheres. 2003;. Flegal AR, Bruland KW, Ndung'u K, Franks RP. Organic complexation and total dissolved trace metal analysis in estuarine waters: Comparison of solvent-extraction GFAAS and chelating resin flow injection ICP-MS Analysis. Analytica Chimica Acta. 2003;. Flegal AR, Luengen AC, Friedman CS, Raimondi PT. 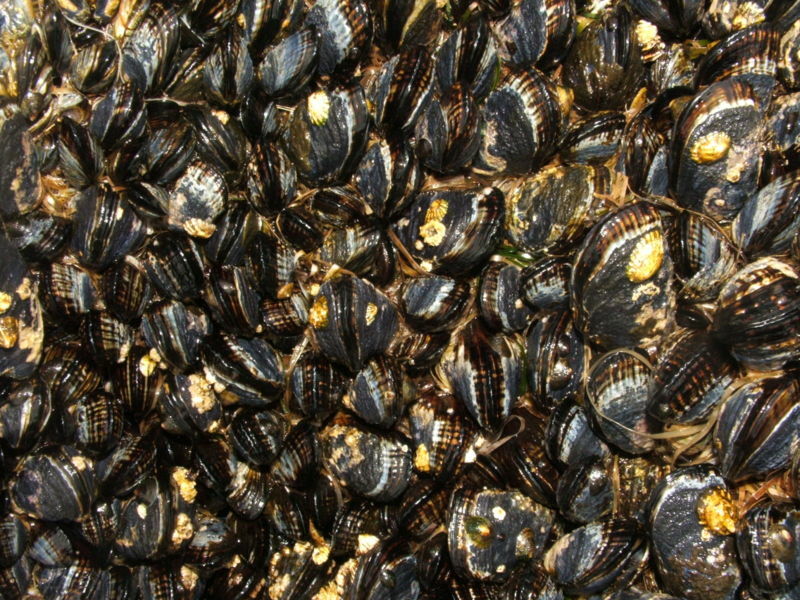 Evaluation of immune responses as indicators of contamination in San Francisco Bay, Using a novel phagocytosis and phagocytic index method developed for mussels. Marine Environmental Research. 2003;. Greenfield BK, Hrabik TR, Lewis DB, Wilson KA, Kratz TK, Pollard A. Landscape scale variation in taxonomic diversity in four groups of aquatic organisms: the influence of physical, chemical and biological properties. Ecosystems. 2003;. Flegal AR, Dunlap C, Steding D, Unruh J, Alpers C, Bouse RM. Anthropogenic sources of lead in the Sacramento and San Joaquin drainage basins. Environmental Science and Technology. 2003;. Flegal AR, Conaway C, Squire S, Mason RP. Mercury speciation in the San Francisco Bay estuary. Marine Chemistry. 2003;. Flegal AR, Scelfo GM, Sanudo-Wilhelmy SA, Ndung'u K. The estuarine cycles of cobalt in San Francisco Bay and the New York Bight. Limnology and Oceanography. 2003;. Oros DR. Surveillance monitoring for new organic contaminants in the San Francisco Estuary. 2003;Spring, 8:5-6. Salop P, Gunther A, Bell D, Clark S, Cotsifas J, Gold J, et al.. Ambient Water Toxicity in San Francisco Bay: 1993 - 2002. 2003. Hetzel F. PCBs Total Maximum Daily Loads, San Francisco Bay. The 20003 RMP Annual Meeting: San Francisco Estuary Institute; 2003. McKee LJ ., Leatherbarrow JE. A Watershed Year for RMP & CEP: Sources Pathways & Loadings 2002/2003. The 2003 RMP Annual Meeting: San Francisco Estuary Institute; 2003. Oros D. Identification and Evaluation of Previously Unknown Organic Contaminants in the San Francisco Estuary (1999-2001). 2003. Kelly JM. The Clean Estuary Partnership and the RMP: Comparing two stakeholder programs producing science in support of policy. 2003. Tucker D. Benefits of the RMP and Challenges for the Future. 2003. Gunther AJ. Benefits of the RMP and Challenges for the Future: Scientific Community Perspective. 2003 RMP Annual Meeting: City of San Jose; 2003. Davis JA, Lowe S, Hunt JA, Crane D, Ross JRM, Lovvom J, et al.. Selenium Concentrations in Surf Scooter and Greater Scaup from the San Francisco Estuary. Oakland, Ca: San Francisco Estuary Institute; 2003. Whyte D. Developing Water Quality Solutions for San Francisco Bay. The 2003 RMP Annual Meeting: California Regional Water Quality Control Board, San Francisco Bay Region; 2003. Schubel JR. Monitoring of San Francisco Bay: Is the Whole Less than the Sum of the Parts?. San Francisco Estuary Institute; 2003. McKee LJ ., Davis JA, Ganju N, Shellenbarger G, Schoellhamer DH. Sediment Dynamics Drive Contaminant Dynamics. The 2003 RMP Annual Meeting: San Francisco Estuary InstituteU.S. Geological Survey; 2003. Greenfield BK, Davis JA. A mass balance model for the fate of PAHs in the San Francisco Estuary. CalFed Science Conference, January 2003: San Francisco Estuary Institute; 2003. Gobas F, Wilcockson J. PCB Movement through the Food-Web of San Francisco Bay: Development of a Model. 2003. Greenfield BK, Davis JA, David N, Leatherbarrow JE. Choosing a Future Bay: The Long - Term Fate of PCBs and Other Organics. Oakland, CA: San Francisco Estuary Institute; 2003. Davis JA, Taberski K. Monitoring Water Quality in San Francisco Bay: Lessons Learned After Ten Years of Regional Monitoring. San Francisco Estuary Institute; 2003. San Francisco Estuary Institute. 2001 Annual Results: San Francisco Estuary Regional Monitoring Program for Trace Substances. Oakland, CA: San Francisco Estuary Institute; 2003 . Report No. : 280. McKee LJ ., Davis JA, Leatherbarrow JE, Newland S. A review of urban runoff processes in the Bay Area: Existing knowledge, conceptual models, and monitoring recommendations. Oakland, CA: San Francisco Estuary Institute; 2003 . Report No. : 66. Flegal AR, Watson EB, Conaway CH, Flanders JR. Mercury deposition in a tidal marsh downstream of the historic New Almaden mining district, CA. 2003 . Report No. : 286. Davis JA, Lowe S, Anderson B, Phillips BM, Hunt JA, Tjeerdema RS, et al.. Summary of 10 years of sediment toxicity monitoring for the San Francisco Estuary RMP. San Francisco Estuary Institute; 2003 . Report No. : 281. Greenfield BK, Davis JA, Fairey R, Ichikawa G, Roberts C, Crane DB, et al.. Contaminant Concentrations in Fish from San Francisco Bay, 2000. Oakland, CA: San Francisco Estuary Institute, Moss Landing Marine Laboratories, Water Pollution Control Laboratories, California Department of Fish and Game, Hazardous Materials Laboratory, Cal/EPA; 2003 . Oros DR. Identification and evaluation of previously unknown organic contaminants in the San Francisco Estuary (1999-2001). Oakland, CA: San Francisco Estuary Institute; 2003 . Report No. : 75. Yee D. San Francisco Bay Ambient Monitoring Interim Report. 2003 . Report No. : 751. Davis JA. The Long-Term Fate of PCBs in San Francisco Bay. 2003 . SFEI. 2003 Pulse of the Estuary: Monitoring & Managing Contamination in the San Francisco Estuary. Oakland, CA: San Francisco Estuary Institute ; 2003 . Report No. : 74. Gobas F, Wilcockson F. San Francisco Bay PCB Food - Web Model. Oakland, Ca: San Francisco Estuary Institute , Simon Fraser University, EVS Environmental Consultants; 2003 . Report No. : 90. Bruland KW, Beck NG, Rue EL. Short-term biogeochemical influence of a diatom bloom on the nutrient and trace metal concentrations in a South San Francisco Bay microcosm experiment. Estuaries. 2002;. Flegal AR, Squire S, Scelfo GH, Revenaugh J. Decadal trends of silver and lead contamination in San Francisco Bay surface waters. Environmental Science and Techology. 2002;36:2379-2386. Greenfield BK, Fairey R, Ichikawa G, Tjeerdema RS, Roberts C, May MD, et al.. Contaminant concentrations in sport fish from San Francisco Bay, 1997. Marine Pollution Bulletin, accepted with revisions. 2002;44:1117-1129. Bruland KW, Gee AK. Tracing Ni, Cu and Zn kinetics and equilibrium partitioning between dissolved and particulate phases in South San Francisco Bay, CA, using stable isotopes and HR-ICPMS. Geochimica Cosmochimica Acta. 2002;66:3062-3082. Greenfield BK, Lewis DB, Hinke JT. Effect of injury in salt marsh periwinkles (Littoraria irrorata Say) on resistance to future attacks by blue crabs (Callinectes sapidus Rathbun). American Malacological Bulletin. 2002;17:141-146. Flegal AR, Spinelli GA, Fisher A, Wheat CG, Tryon MD, Brown KM. Groundwater seepage into northern San Francisco Bay: implications for dissolved metals budgets. Wate Resources Research. 2002;. Flegal AR, Squire S, Scelfo GH, Revenaugh J. Decadal decline of anthropogenic silver in San Francisco Bay: Comparison with lead. Environmental Science and Technology. 2002;. Bruland KW, Franks RP, Beck NG. Analysis for Cd, Cu, Ni, Zn and Mn in estuarine water by inductively coupled plasma mass spectrometry coupled with an automated flow injection system. Analytica Chimica Acta. 2002;455:11-22. Davis JA. Estuary News RMP Insert 2002. Estuary News. 2002;. Oros DR. RMP detective work: Identifying new organic contaminants in the Estuary. 2002;Winter, 6:7. Davis JA, Leatherbarrow JE, Yee D. Organic Contaminant Concentrations in Bay Area Effluents. The 2002 RMP Annual Meeting: San Francisco Estuary Institute; 2002. Grovhoug T, Hall T, Olivieri E, Walker L. Copper and Nickel Impairment Assessment. 2002. Inc. TTech. Copper and Nickel TMDL Development: Lower South Bay. Presented at the 2002 RMP Annual Meeting; 2002. Davis JA, Taberski K. NorCal SEATAC 2001 - Seafood Contamination and Consumption. 2002. Davis JA. New Directions for the RMP: An Overview. San Francisco Estuary Institute; 2002. Davis JA. Water Quality in San Francisco Bay. Richmond, CA: San Francisco Estuary Institute; 2002. Davis JA. The long term fate of PCBs in San Francisco Bay. Oakland, CA: San Francisco Estuary Institute; 2002. Greenfield BK, Davis JA. Contaminant concentrations in fish: 2000 (Oral Presentation). Oakland, CA. ; 2002. David N, Oros DR, Risebrough R. Surveillance Monitoring in the RMP. The 2002 RMP Annual Meeting; 2002. Stevens D. Determining the Spatial Distribution of Water and Sediment Sampling Locations. Oregon State University; 2002. Greenfield BK, Davis JA, Fairey R, Crane D, Ichikawa G, Roberts C. Contaminant concentrations in fish in San Francisco Bay: 2000. Davis, CA; 2002. McKee LJ ., Davis JA, Leatherbarrow JE, Newland S. Urban Runoff Literature Review (TMDL Presentation). San Francisco Estuary Institute; 2002. Thompson B. SFEI: More Than Just RMP (2002 RMP Annual Meeting). 2002. Davis JA. The Long-Term Fate of PCBs in San Francisco Bay. 2002. San Francisco Estuary Institute. Regional Monitoring of Water Quality in San Francisco Bay: Lessons Learned After Ten Years. 2002. Looker R. Current Regulatory Approach to Copper in San Francisco Bay: Source Control, Pollution Prevention, and Monitoring. San Francisco Estuary Institute; 2002. May M. The Pulse of the Estuary: 2000 Update. The 2002 RMP Annual Meeting: San Francisco Estuary Institute; 2002. Lowe S, Hoenicke R, Grosso C, Thompson B, Stevens D, Leatherbarrow JE, et al.. The Design Process for the Status and Trends Component. San Francisco Estuary Institute; 2002. San Francisco Estuary Institute. Process and Products for RMP Redesign Implementation by January 2002. Richmond, CA: San Francisco Estuary Institute; 2002. McKee LJ . Loadings of Particles and Contaminants to the Bay from the Central Valley. San Francisco Estuary Institute; 2002. McKee LJ ., Hoenicke R, Leatherbarrow JE. Contaminants at the Estuary Interface. San Francisco Estuary InstituteCalifornia Resources Agency; 2002. Hoenicke R, Tucker D, Tsai P, Hansen E, Lee K, Yee D. Atmospheric Deposition of Trace Metals in San Francisco Bay. Richmond, CA: San Francisco Estuary Institute; 2002 . Report No. : 278. McKee LJ ., Davis JA, Hoenicke R, Yee D, Ganju N, Leatherbarrow JE, et al.. Estimates of suspended-sediment flux entering San Francisco Bay from the Sacramento and San Joaquin Delta. 2002 . Report No. : 65. McKee LJ ., Hoenicke R, Leatherbarrow JE. Estuary Interface Pilot Study (1996 - 1999). 2002 . Buchanan PA, Ganju NK. Sediment Toxicity Identification Evaluations San Francisco Bay Regional Monitoring Program for Trace Substances. Richmond, CA: San Francisco Estauary Institute; 2002 . Report No. : 243. Stevens D. Estimation of Means, Totals, and Distribution Functions from Probability Survey Data. Oakland, CA: San Francisco Estuary Institute; 2002 . Report No. : 110. Flegal AR, Bruland KW, Roitz JS. The biogeochemical cycling of manganese in San Francisco Bay: Temporal and spatial variations. 2002 pp. 227-239. Report No. : 52. McKee LJ . Mallard Island. 2002 . Greenfield BK, Fairey R, Roberts C, Negrey J, Sigala MA, Davis JA. The relationship between trophic position, spatial location, and contaminant concentration for San Francisco Bay sport fish: a stable isotope study. Oakland, CA: San Francisco Estuary Institute; 2002 . Report No. : 487. Davis JA. A PCB Budget for San Francisco Bay. Oakland, CA: San Francisco Estuary Institute; 2002 . Report No. : 376. Oros DR, Leatherbarrow JE, Davis JA. 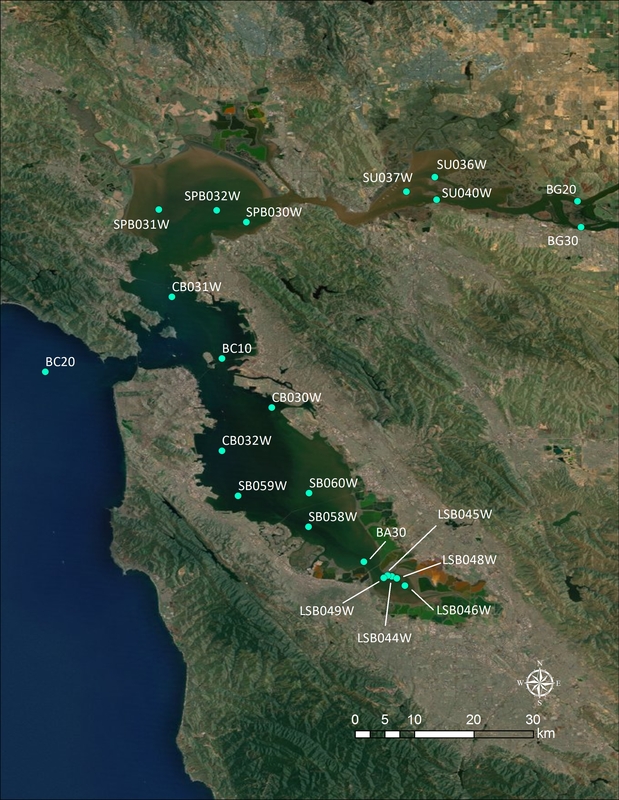 Polychlorinated Biphenyls in Northern San Francisco Estuary Refinery Effluents. 2002 . Report No. : 510. David N, Oros DR. Identification and evaluation of unidentified organic contaminants in the San Francisco Estuary. Oakland, CA: San Francisco Estuary Institute; 2002 . Report No. : 45. May M, SFEI. 2000 Pulse of the Estuary: Monitoring and Managing Contamination in the San Francisco Estuary. Oakland, CA: San Francisco Estuary Institute; 2002 . Report No. : 88. San Francisco Estuary Institute. 2000 Annual Results: San Francisco Estuary Regional Monitoring Program for Trace Substances. Oakland, CA: San Francisco Estuary Institute; 2002 . Report No. : 238. Salop P, Gunther A, Bell D, Cotsifas J, Gold J, Ogle S. Episodic Ambient Water Toxicity in the San Francisco Estuary. Oakland, CA: San Francisco Estuary Institute; 2002 . Report No. : 51. Greenfield BK. Stable isotopes may help explain fish contamination patterns in the Estuary. 2002. pp. 1-6. San Francisco Estuary Institute. RMP Re-design Extended Schedule. San Francisco Estuary Institute; 2001. Lowe S. Bay Segmentation Presentation. Richmond, CA: San Francisco Estuary Institute ; 2001. Lowe S, Grosso C. RMP Redesign Presentation. Richmond, CA: San Francisco Estuary Institute ; 2001. Salop P, Gunther AJ, Bell D, Cotsifas J, Gold J, Ogle SR. San Francisco Bay Episodic Toxicity Report - 2000. Richmond, CA: San Francisco Estuary Institute; 2001 . Report No. : 233. Greenfield BK, Lowe S, Ross JRM. Potential biological indicators of contaminant effects for use in monitoring the San Francisco Estuary. San Francisco Estuary Institute; 2001 . Report No. : 43. Hoenicke R, Tucker D, Tsai P, Hansen E, Lee K. San Francisco Bay Atmospheric Deposition Pilot Study (Trace Metals): Presentation at 2001 WEFTEC. Richmond, CA: San Francisco Estuary Institute; 2001 . Report No. : 235. SFEI, CDHS. The San Francisco Bay Seafood Consumption Study Report. Oakland, CA: San Francisco Estuary Institute; 2001 . Report No. : 369. SFEI. 1993 - 1999 Pulse of the Estuary: Monitoring and Managing Contamination in the San Francisco Estuary. Oakland, CA: San Francisco Estuary Institute; 2001 . Report No. : 101. San Francisco Estuary Institute, Branch CDepartment. San Francisco Bay Seafood Consumption Report. 2001 . May M. Results of the San Francisco Bay Seafood Consumption Study. 2001 . Report No. : 230. Davis JA, Gunther AJ, Abu-Saba KE. Technical Report of the Sources, Pathways, and Loadings Workgroup. Richmond, CA: San Francisco Estuary Institute; 2001 . Report No. : 266. David N, Bell D, Gold J. Field Sampling Manual for the Regional Monitoring Program for Trace Substances. Richmond, CA: San Francisco Estuary Institute; 2001 . San Francisco Estuary Institute. 1999 Annual Results: San Francisco Estuary Regional Monitoring Program for Trace Substances. Oakland, CA: San Francisco Estuary Institute; 2001 . Report No. : 351. Phillips BM, Anderson BS, Hunt JW. Sediment Toxicity Identification Evaluations San Francisco Bay RMP for Trace Substances - Progress Report. Richmond, CA: San Francisco Estuary Institute; 2001 . Report No. : 46. Hoenicke R, Tsai P, Hansen E, Lee K. San Francisco Bay Atmospheric Deposition Pilot Study Part 2: Trace Metals. Richmond, CA: San Francisco Estuary Institute; 2001 . Report No. : 73. Hoenicke R, Tsai P. San Francisco Bay Atmospheric Deposition Pilot Study Part 1: Mercury. Richmond, CA: San Francisco Estuary Institute; 2001 . Report No. : 72. Lowe S, Hoenicke R, Scelfo GH, Yee D, Davis JA. 2001 Quality Assurance Project Plan: Regional Monitoring Program for Trace Substances. San Francisco Estuary Institute; 2001 . Report No. : 33. Greenfield BK. Contaminant concentrations in Delta fish. 2001. pp. 1-3. Jarman WM, Johnson GW, Bacon CE, Ehrlich R, Risebrough RW, Davis JA. Unmixing polychlorinated biphenyl source fingerprints in surface waters of San Francisco Bay. Environmental Science and Technology. 2000;34:552-559. Connor MS, Schubel JR, Shaw DG. Petroleum development moratoria on Georges Bank: Environmental decision making where values predominate. Environmental Science and Technology. 2000;34:4677-4683. Connor MS, Schubel JR, Shaw DG, Farrington JW, Tripp BW. The role of environmental scientists in public policy: A lesson from Georges Bank. Marine Pollution Bulletin. 2000;40:727-730. Flegal AR, Abu-Saba KE, Sedlak DL. Indirect reduction of hexavalent chromium by copper in the presence of superoxide. Marine Chemistry. 2000;69:33-41. Greenfield BK, Hrabik TR, Harvey CJ, Carpenter SR. Predicting mercury levels in fish: use of water chemistry, trophic ecology, and spatial traits. Canadian Journal of Fisheries and Aquatic Sciences. 2000;58:1419 -1429. Davis JA, Hoenicke R, Gunther A, Thompson B. An overview of contaminant-related issues identified by monitoring in San Francisco Bay. Environ. Mon. Assess. 2000;64:409-419. Flegal AR, Dunlap CE, Bouse RM. Past leaded gasoline emissions as a nonpoint source tracer in riparian systems: A study of river inputs to San Francisco Bay. Environmental Science and Technology. 2000;34:1211-1215. Oros DR, Taberski K. Closing in on unidentified contaminants. 2000;:p. 18-19. McKee LJ ., Davis JA. Estuary News RMP Insert 2000. Estuary News. 2000;. Greenfield BK, Davis JA. Contaminant Concentrations in Fish: 2000. 2000. San Francisco Estuary Institute. Final RMP Pilot/Special Study Selection Procedure (Approved October 16, 2000). Richmond, CA: San Francisco Estuary Institute; 2000. San Francisco Estuary Institute. Policy Statement on Requests for Collaborative Work - Regional Monitoring Program. San Francisco Estuary Institute; 2000. San Francisco Estuary Institute. Protocol for Accessing and Sampling Archived Sediments from the San Francisco Estuary RMP for Trace Substances. San Francisco Estuary Institute; 2000 . Report No. : 119. May M. The Pulse of the Estuary: Tracking Contamination with the Regional Monitoring Program 1993-1998. San Francisco Estuary Institute; 2000 . Report No. : 100. Cloern JE, Cole BE, Edmunds JL, Schraga TS, ArnsbergScripps A. Patterns of Water-Quality Variability in San Francisco Bay During the First Six Years of the RMP, 1993-1998. Richmond, CA: San Francisco Estuary Institute; 2000 . Report No. : 41. San Francisco Estuary Institute. 1998 Annual Results: San Francisco Estuary Regional Monitoring Program for Trace Substances. Oakland, CA: San Francisco Estuary Institute; 2000 . Report No. : 334. Salop P, Gunther A, Bell D, Cotsifas J, Gold J, Ogle SR. Episodic Toxicity in the San Francisco Bay System - 2000. 2000 . Lowe S, Thompson B, Kellogg M. Macrobenthic Assemblages of the San Francisco Bay-Delta, and their Responses to Abiotic Factors. 2000 . Gunther AJ, Ogle SR. San Francisco Bay Episodic Toxicity Report:1999 Progress Report. Richmond, CA: San Francisco Estuary Institute; 2000 . Report No. : 346. Davis JA, Crane D, Ichikawa G, May M. Contaminant Concentrations in Fish from the Sacramento - San Joaquin Delta and Lower San Joaquin River, 1998. Richmond, CA: San Francisco Estuary Institute; 2000 . Report No. : 340. Daum T, Lowe S, Toia R, Bartow G, Fairey R, Anderson J, et al.. Sediment Contamination in San Leandro Bay, CA. Oakland, CA: San Francisco Estuary Institute; 2000 . Report No. : 48. Lowe S, Thompson B, Kellogg M. Results of the Benthic Pilot Study 1994 - 1997, Part 1. Richmond, CA: San Francisco Estuary Institute; 2000 . Report No. : 39. Phillips BM, Anderson BS, Hunt JW. Investigations of Sediment Elutriate Toxicity at Three Estuarine Stations in San Francisco Bay, California. Richmond, CA: San Francisco Estuary Institue; 2000 . Report No. : 374. Greenfield BK. Predicting mercury levels in fish: use of water chemistry, trophic ecology, and spatial traits (M.S. Thesis). [Madison]: University of Wisconsin; 2000. Flegal AR, Luoma SN, Ritson PI, Bouse RM. Stable lead isotopic analyses of historic and contemporary lead contamination of San Francisco Bay estuary. Marine Chemistry. 1999;64:71-83. Stephenson M, Hardin D, Gunther AJ, Sericano J, Bell D, Scelfo GH, et al.. Long term bioaccumulation monitoring with transplanted bivalves in San Francisco Bay. Marine Pollution Bulletin. 1999;38:170-181. Anderson B, Phillips BM, Hunt J, Taberski K, Thompson B. Relationships Between Sediment Toxicity and Contamination in San Francisco Bay. Marine Environmental Research. 1999;48:285-309. San Francisco Estuary Institute. SFEI Policy: Release of Preliminary Data from the RMP (Revised May 10, 1999). Richmond, CA: San Francisco Estuary Institute; 1999. San Francisco Estuary Institute. RMP Re-design Schedule. 1999. San Francisco Estuary Institute. Report of the Pesticide Workgroup. Richmond, CA: San Francisco Estuary Institute; 1999 . Davis JA, Lowe S, Hoenicke R, Scelfo GH. 1999 Quality Assurance Project Plan for the Regional Monitoring Program for Trace Substances. Richmond, CA: San Francisco Estuary Institute; 1999 . Report No. : 373. Lowe S, Thompson B, Gravitz L. Sediment Conditions near Wastewater Discharges in San Francisco Bay. Oakland, CA: San Francisco Estuary Institute; 1999 . Davis JA, Hoenicke R, Gunther A, Thompson B. An Overview of Contaminant-Related Issues Identified by Monitoring in San Francisco Bay - Abstract. 1999 . San Francisco Estuary Institute. 1997 Annual Report: San Francisco Estuary Regional Monitoring Program for Trace Substances. Richmond, CA: San Francisco Estuary Institute; 1999 . Report No. : 37. Davis JA, Young D, H. III L, Hornberger M, Gregg J, Delorey J, et al.. Recommendations for Improvement of RMP Sediment Monitoring. Richmond, CA: San Francisco Estuary Institute; 1999 . Palenik B, Flegal RA. Cyanobacterial Populations in San Francisco Bay. Richmond, CA: San Francisco Estuary Institute; 1999 . Report No. : 42. Hoenicke R, Gunther A, Thompson B, Davis JA. Regional Monitoring in San Francisco Bay: A Summary of Key Issues. 1999 . Report No. : 36. San Francisco Estuary Institute. Report of the Bioaccumulation Workshop. Richmond, CA: San Francisco Estuary Institute; 1999 . Davis JA, Yoon J. Technical Report of the Chlorinated Hydrocarbon Workgroup. Richmond, CA: San Francisco Estuary Institute; 1999 .